Basement crack repair can keep your building strong and dry. Cracks in your basement walls can form over time due to pressure from soil and water. You may not even notice basement wall problems until it becomes a major issue – so it’s important to inspect your basement on a regular basis. Once basement wall problems become serious, you will notice things like water leakage, bowing walls, and major cracks in the wall. My Foundation Repairs has access to basement and foundation contractors all over the country. 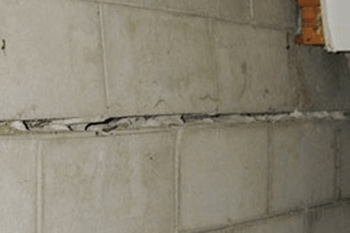 If you have basement wall cracks, you may be experiencing foundation settlement. What Causes Basement Foundation Problems? Most foundation issues are caused by movement in the soil beneath the foundation. As the soil moisture content changes, the soil will shift and move. When this occurs, the foundation of your home will gradually shift and move as well. At the first signs of foundation failure, it is important to contact a specialist. Foundation repair is not a DIY project and needs to be handled by a professional. Structural problems will only get worse over time, so don’t hesitate when looking into repair options. It is important to remember that if you have a basement crack, it may not just be the crack that may need to be fixed, but the actual foundation of your home. Let My Foundation Repairs get a contractor in your area that specializes in foundation problems to come and give your home an inspection. Our patented solutions will give your home permanent stability so that you will never struggle with foundation problems again. We can seal basement wall cracks and prevent water from entering your home. Helical piers are used when there is a need to resist tension, or a compressive force, or both. They can be combined with a helical bracket as well. Steel piers provide a two-fold system that includes driving the steel piers deep into the soil through unstable soil layers until they reach weight bearing stratum. Helical tieback anchors are installed if you have bowing or leaning walls. They will keep the wall from bowing or leaning in the future. Hydraulic slab lift piers are a fairly new option for leveling concrete slabs. They work much the same way as the other resistant piers. All of the products used by My Foundation Repairs contractors are manufactured by Earth Contact Products (ECP), the leader in the manufacturing of foundation repair and basement waterproofing products in the industry. You know you are getting the best when you hire a contractor from My Foundation Repairs. Don’t let your basement cracks be ignored; they can be signs of a more serious problem that needs to be taken care of before any more major problems arise. Let the contractors at My Foundation Repairs give you a free inspection and answer any questions you may have. Contact us today!